Somalia is in the news, once again, for all the wrong reasons. And thanks to the ‘Pirates of the Horn of Africa’ there is a flurry of activity everywhere. Take international maritime powers for instance. They are busy drawing plans to beef up security in the Gulf of Aden and Indian Ocean to ward off further attempts of commercial ships getting hijacked despite their heavy presence. Or let’s talk about security analysts or marine experts who are coming up with ideas ranging from invading Somalia to surgical strikes on pirate hideouts to effective blockade of Somali waters. Will these measures work? I see where these solutions are coming from. The brightest minds are busy pondering the solutions on how to resolve the situation and make the international waterways safe once again for the trade. Everyone is thinking according to their trade and expertise. But let’s, for an instance, consider ourselves as an ordinary Somali and try to understand the problems they are facing during the last two decades. Then only we will be in a position to suggest the solution to the problems faced by them. Imagine you are living in either Mogadishu or any other far flung village of Somalia. You’ll discover yourself surrounded by lawlessness, poverty, unemployment, lack of basic necessities of life and absence of any governmental structure. The last time an administration ever functioned in the country was in 1991. Since then the country is in limbo and any decent effort to return to normalcy has been blocked by internal and external powers. After gaining its independence from Britain and Italy in 1960, Somali leadership very soon drifted towards the Communist bloc as General Siad Barre seized control after a coup d’état. Staying relatively stable during his 22 years in power, the country plunged into chaos after a foreign engineered military coup ousted General Barre. As a result, the whole country destabilized and a civil war broke out. Many Somalis, despite decades of mismanagement, give credit to General Barre for trying to forge unity among Somali people and uproot the centuries old clan system. The deep divisions resurfaced within no time as soon as the tribal warlords drove him out of power. Backed by Somalia’s arch rival, Ethiopia, General Farah Aidid, Abdirahman Toor and Ali Mahdi Muhammad combined to remove President General Siad Barre though later turning guns on each other. The worsening situation got completely out of control when foreign troops under the mandate of United Nations stepped on Somali soil. American forces launched Operation Restore Hope in order to maintain the law and order situation in Somalia and coordinate UN humanitarian aid distribution program. But things did not go according to the plan. Instead of being welcomed as saviors, American troops along with other coalition forces were seen as invaders prompting clashes with vying Somali factions. In a bloody clash with Somali insurgents, 19 US servicemen lost their lives, along with several other casualties suffered by UN forces. As a result, American troops were immediately withdrawn from the country, severely affecting the aid supply and renewing the civil war that paused when UN-backed forces arrived in Somalia. On 12 July 1993, US forces attacked a safe house in Mogadishu that killed 73 tribal elders taking part in a meeting became the turning point of the conflict. According to critics of the UN mission, Somalis since that day lost their faith in UN troops and unified under a single banner to oust them. Amidst decades of utter chaos, Somalia had its chances of peace and did see glimmer of hopes for stability. But thanks to foreign intervention the forces that tried to end factional warfare and curb warlordism were attacked and their attempts sabotaged. The Union of Islamic Courts, despite allegations that they sought to impose their form of Sharia in the country, defeated and neutralized the warring militias in Mogadishu. As a result, peace returned to the streets of Mogadishu for the first time since 1991. Shops reopened, people began returning to their homes and the port began functioning thanks to the security provided under the UIC controlled areas. However, peace was never given a chance to establish itself. The United States of America, along with other western and regional powers intervened in Somali affairs only to push the country into further chaos. Citing ‘fears’ that the group is aligned to Osama bin Laden’s al-Qaeda, warlords opposed to the UIC were heavily armed and encouraged to overthrow the Islamist administration in Mogadishu. When the warlords couldn’t deliver a breakthrough on their own, Ethiopia was asked to invade the country to overthrow the UIC regime. As a result, heavy fighting and bloodshed erupted on the streets of Mogadishu as chaos made a strong comeback. Accused of using heavy-handed tactics and killing ordinary civilians, the extremely unpopular Ethiopian occupation forces left Somalia by the end of 2008. So, what in your opinion a catalogue of intervention and chaos invites to a society? Somalia got civil war, famine, poverty, corruption and – on top of it – piracy as a result of two decades of conflict. Virtually non-existent till 1991, piracy became one of the major problems posed by Somalia. Pirates carried out low profile attacks on shipping vessels and sought ransom. Their activities came to an immediate halt when UIC militia captured Mogadishu and clamped down on their activities. 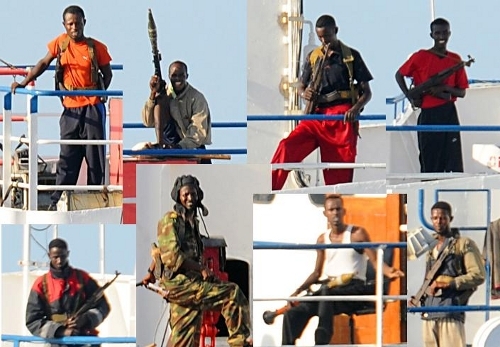 The pirates made a powerful comeback soon after the overthrow of UIC militia by Ethiopia-backed Somali groups in 2007. According to UNOSAT, more and other shipping agencies, than 300 hijackings have taken place since 2007. Taking into consideration the UN estimate that more than 80% of the population earning less than $2 a day, let us consider the options Somalis are left with to earn their living. Agriculture – More than 2/3 of Somali workforce is employed in the agricultural sector. Continuous droughts and famines during the last two decades have wiped out agricultural lands. Low rainfall during 2008 compounded the misery of the people. It led to acute shortages of food and pasture, forcing thousands of people to migrate internally in search of water. Fishing – Given the 3,000 km long coastline with a 200 nautical mile of territorial sea boundary, fishing seems to be the best natural option for Somalis, especially when majority of the population lives in the towns located on the coast. But it comes with its own cost. Somali territorial waters have been invaded by foreign fishing trawlers. As a result, thousands of Somali fishermen have been deprived of their vital livelihood. According to High Seas Task Force report, the value of illegally, unregulated and unreported fishing catches fetches from $4 to $9 billion, most of it coming from Sub-Saharan Africa, particularly Somalia. The root of this problem too originates from the 1991 civil war that led to the disintegration of Somali police and coast guard forces. Cashing in on the chaos in the mainland, illegal fishing trawlers trespass and fish in Somali territory, including the 12-mile inshore artisanal fishing waters. The invading foreign vessels are armed and intimidate Somali fishermen by pouring boiling water on them, cutting their nets, crushing smaller boats and killing all the occupants, and many other abuses in a bid to steal their national fishing turf. The fishing vessels take due advantage of the absence of a Somali navy force that can monitor its territorial waters. Pirates have targeted hundreds of fishing vessels to date. Most of the illegal foreign fishing trawlers that have being fishing in Somalia since 1991 are owned by EU and Asian fishing companies – Italy, France, Spain, Greece, Russia, Britain, Ukraine, Japan, South Korea, Taiwan, India, Yemen and many others. According to the High Seas Task Force, these illegal foreign vessels take out more than $450 million in fish value out of Somalia annually. They do not compensate the local fishermen, pay tax, royalties, or respect any conservation and environmental regulations – norms associated with regulated fishing. It is believed that IUUs from the EU alone deprive the country more than five times the value of its aid to Somalia every year. Another serious issue of alarming proportions that Somalis face is the industrial, toxic and nuclear waste dumping in both off-shore and on-shore areas. Local fishermen, civil society organizations and international organizations have reported and warned of the dangerous consequences of these criminal actions and environmental crimes. There have been several incidents of oil spills, toxic and nuclear waste dumping in the Somali coast though no action was taken by international authorities. The problem does not stop here. The world body, supposed to be unbiased and impartial in its approach, fails to live up to its mandate. The resolutions passed by the United Nations condemned hijackings in the Gulf of Aden and Indian Ocean and gave wide ranging powers to European Union, US, Russia, Japan, India, Korea and many other regional powers to patrol Somali waters under the pretext of containing piracy while they carry out illegal fishing activity unabated. Naval powers of the world, including US, EU, Russia, Canada and Australia patrol the waters adjacent to Somali coast in a bid to check piracy. It is interesting to note that not a single African naval vessel is included in the international patrols. Due to the absence of a strong Somali representative in the United Nations, UN Resolutions 1816 and 1838 were passed and enforced. Both the resolutions unilaterally condemn Somali piracy in the Gulf of Aden and Indian Ocean and give the right to foreign naval vessels to patrol Somali waters to keep pirates at bay. These resolutions, however, ignore the objections of the Somali civil society and fail to address their concerns. Somali lack of authority and unfair and biased treatment meted out by the international community has shoved this rich fishing zone into the mouth of exploitation and subsequent depletion. Whose fault is it? Is it still fair to suggest a military or diplomatic solution of a problem that exists due to the absence of a viable government and civil society? The world may be tempted to apply the ‘might is right’ logic to tackle piracy but is it ready to let the pirates transform into terrorists? The answer will be a definite ‘no’ but the solution lies in delivering justice not just meting out punishment.